Stephen Keely, Pat Wells and Brucie Palmer-Howarth, supported by Southdown’s Chris Jennings and Ross Offen held a fundraising event, raising just over £136. 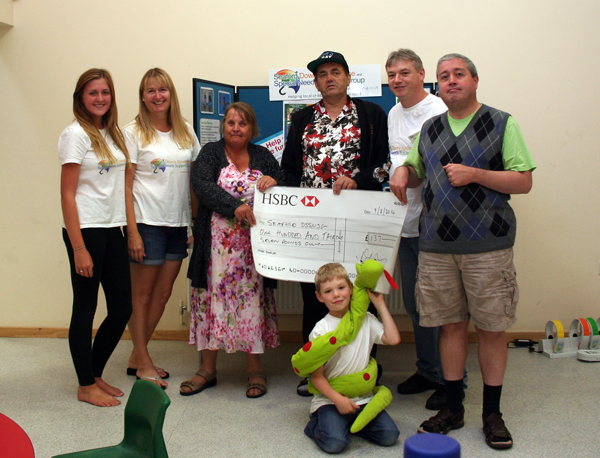 Stephen, Pat Wells, Brucie and Chris came along to our August 2014 drop-in to present us with a cheque for £136. The money was raised by holding a fundraising day including a hot dog lunch, selling raffle tickets and also selling brik a brac. A really big thank you to Stephen Keely, Pat Wells, Brucie Palmer-Howarth, Chris Jennings and Ross Offen – Thank for all your hard work! Southdown is the largest not-for-profit specialist provider of care, support and housing services to vulnerable people across Sussex. Each year, Southdown provides support to over 9,500 people, no matter what background or challenges they have, to help them live their life to the full. They do this through a range of tailored community-based services that support people to develop, maintain and improve good health, well-being and independence. Services provided by Southdown include: care and support for people with learning disabilities, mental health recovery services which include employment support, housing support services for people at risk of homelessness and supported accommodation.